One question I get asked a lot as a personal finance fanatic (say that three times fast!) 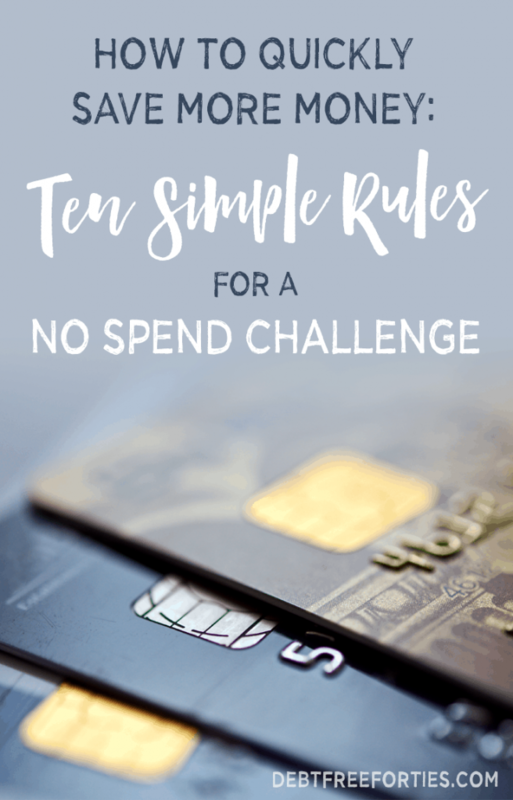 is what the rules of a no spend challenge are. 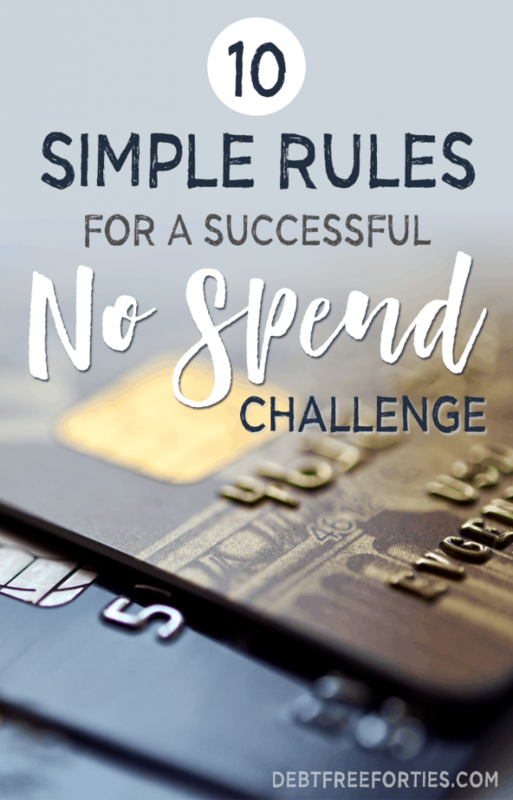 While there are plenty of very specific no spend challenges you can take, it’s a very personal choice as to which one to embark on. The key takeaway of a no spend challenge is to reduce your outgoing money by cutting out non-essentials. Yes, you’re already doing that with a budget, but during a no spend challenge you’re amping it up and cutting even more. So what’s the difference between a budget and a no spend challenge? And why should you start one? A no spend challenge is choosing a period of time, say a weekend, week or even a month, to not spend any money. Some people choose to have allowances, like groceries and gas. The purpose of the no spend challenge is to help you reset after a holiday, vacation, or to get back on track from an emergency or spending slip up. It can also be a great way to kickstart your savings or debt repayment on things like student loans with the chunk of money you save from the challenge. Now that you’ve grabbed your free worksheets, read through the rules below, grab a pen, and get to planning your own personal no spend challenge! No Spend Weekend Challenge: This focuses on finding free activities with family or friends. It’s perfect for anyone who finds themselves spending too much on activities, especially with kids. No Spend Week Challenge: This challenge entails making changes to your daily habits – whether it’s getting a coffee from Starbucks or grabbing lunch with coworkers. No Spend Month Challenge: This challenge can be a doozy, but the rewards are greater. This is about starting to make a permanent lifestyle change for good, rather than just for a week. It’s about stopping habits like shopping and replacing them long term with other cheaper (or free) activities. There are some key steps you need to do in order to ensure that your spending challenge is a success. They’re all about setting rules and making sure everyone is on the same page so there’s no miscommunication and “accidental” (ahem, side eyeing you, donuts and coffee!) spending during the challenge. 1. Figure out why you’re doing it. Create a goal so you have something to focus on, especially if things get tough. Do you want to boost your debt repayment? Are you saving for a vacation? Figure out your long term goal. If you have that in mind, it makes it easier to focus on not spending when a large mocha is staring you in the face. 2. Decide how long you want to do the challenge for. The point is to challenge yourself and see how far you can stretch! A month can be really difficult, but the longer the challenge, the greater the reward. If you’re worried about how difficult it might be, start off easier with a no spend weekend or week. Write them down and post them as a reminder. Are there exceptions, such as purchasing fresh groceries like dairy & produce? Are you setting up cash envelopes for groceries and gas? Make a list of what’s an acceptable purchase and what’s not and hang them on the fridge. 4. Review rules with your spouse/family. Make sure everyone’s on the same page, otherwise it’s useless. It’s important that your spouse and family understand and agree to the goals, so that they’ll be much more likely to play along. 5. Use this period to eat the stock of items in the pantry/freezer. It’s the perfect time to use up all those items that get pushed to the back of the pantry every week. Often, a no spend challenge can be used to rotate out your pantry’s stock and use up items before they expire. It’s the perfect time to get creative with your meals. 6. Research free entertainment for the kids/family. Since having kids, I’ve found out just how expensive it can be to do anything – from eating out to an event, it can put a big dent in your cash flow. Use Google to find sites with free events in your city, have a family game night, or hit the park. 7. Put away the credit/debit cards to avoid temptation. Just do it, as the saying goes. Don’t keep them on you. It’s just too easy to whip out a credit card and use it. Consider creating cash envelopes to help monitor and control spending as needed for things like groceries and gas. 8. Need a distraction? Use this time to get stuff done! If you’re used to cruising sites for the latest deals, this is the perfect time to distract yourself with household activities. Clean out garage and basement, declutter and organize. Donate, throw away, and sell stuff. It’s the perfect time to pick up a side hustle selling your gently used stuff and get it out of your house at the same time! 9. Still want to buy something? Write it down in a list and keep it. Promise yourself that if you can wait until the end of the spending period, you can purchase it. Chances are, after you’ve made it through your no spend challenge, you won’t want it anymore. It’s a great way to break yourself of those impulse purchases! Another idea is to take the money you would have spent on that item and move it into savings. By the end of the challenge, you’ll see how much you would have spent on impulse purchases, which can be a real eye opener! Put it into a separate savings account so that at the end of the month, you can apply it towards your goal. Don’t let it float away into the ether of checking account limbo. No matter how you chose to do your no spend challenge, what’s important is that you are making an effort to change your spending habits. It can be really hard at first, but it’s a great way to reset your mindset and focus more on long term goals versus instant gratification. Spending no money for a month is a lofty goal but definitely doable. To spend no money for a month, you will need to have a budget in place where you’ve planned ahead for that month’s costs. One of the biggest keys to success is thinking ahead. If you know you’ll be participating in kid’s events or extra curricular activities, plan ahead and pack snacks or food. If you know you’ll be meeting up with friends, suggest get togethers that aren’t at a restaurant or cost money. If you’re looking for ideas, check out 50 free things to do on a no-spend weekend. If you have a freebie, no spend weekends are the perfect time to cash them in. Keep an eye on your emails from retailers to see what kind of freebies you can cash in on. Just this past week, I was able to grab an entire 12oz bag of coffee from World Market, just for being a rewards member. There’s nothing like the taste of free coffee in the morning! Lastly, if you’re looking for even more inspiration, check out The No Spend Year: How You Can Spend Less and Live More by Michelle McGagh. 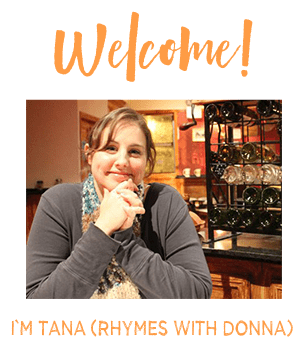 In it, she details how she set a goal for herself to just pay bills with a minimal budget for groceries. The rest she saved while she learned how to socialize and travel for free for an entire year! Have you ever done a no spend challenge? How’d it go? What tips would you recommend? Leave your thoughts in the comments below! Ready to start budgeting or want to hear more about ours? Click here to learn how we’ve paid off $26,619 of Debt in 17 Months! Or, if you’re on a tight budget, here are 11 easy ways to save money on a tight budget.